[Frank] came up with a clever way to extend the storage of his PS4. He’s managed to store his digital PS4 games inside of storage devices in the shape of classic NES cartridges. It’s a relatively simple hack on the technical side of things, but the result is a fun and interesting way to store your digital games. He started out by designing his own 3D model of the NES cartridge. He then printed the cartridge on his Ultimaker 3D printer. The final print is a very good quality replica of the old style cartridge. The trick of this build is that each cartridge actually contains a 2.5″ hard drive. [Frank] can store each game on a separate drive, placing each one in a separate cartridge. He then prints his own 80’s style labels for these current generation games. You would have a hard time noticing that these games are not classic NES games at first glance. Storing the game in cartridge form is one thing, but reading them into the PS4 is another. The trick is to use a SATA connector attached to the PS4’s motherboard. [Frank’s] project page makes it sound like he was able to plug the SATA cable in without opening the PS4, by attaching the connector to a Popsicle stick and then using that to reach in and plug the connector in place. The other end of the SATA cable goes into a custom 3D printed housing that fits the fake NES cartridges. This housing is attached to the side of the PS4 using machine screws. 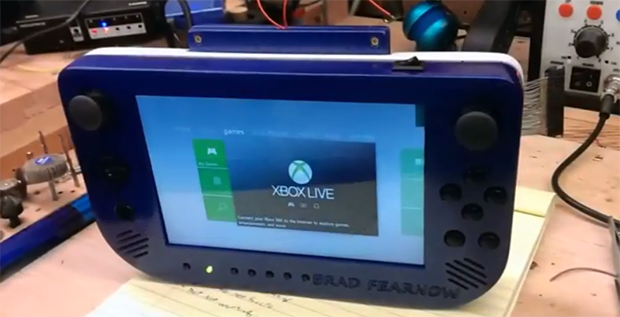 For the past few years now, [Downing] has been working on the dream of all console modders – a console made in the last ten years made portable. He’s spend a lot of time on the effort, and now thanks to a commission, he’s finally done it. Not just one console, either: this thing makes both the Xbox 360 and PS3 a handheld, battery-powered device thanks to some awesome wireless tech and a great deal of skill. A few months ago, [Downing] and friends [Hailrazer] and [RDC] started a Kickstarter for the Cross Plane, a portable device that uses a wireless HDMI transmitter to offload the heavy and hot parts of running a game to a console, while the display and controls are kept portable. That Kickstarter didn’t see the success [Downing] was looking for, but that didn’t stop one enthusiastic supporter from commissioning a piece. The display in the Cross Plane is a 7″ HD display, and the latency on the WHDMI transmitter is just about 1ms – basically unnoticeable. The controls on the front of the portable are wired to ‘controller packs’ that plug into the back, one for Xbox and one for PS3. The build quality is immaculate, and if you’ve ever wanted to know how to expertly finish a 3D printed part so it looks like it came off an assembly line, you should probably check out the build log. If you’d like to play BattleCallSpaceMarine on the Playstation 4 with a keyboard and mouse – and have an unfair advantage over everyone else playing on a console – you’d normally be out of luck. Sony implemented a fair bit of software to make sure only officially licensed controllers are able to talk to the console. It took a while, but [Frank Zhao] has figured out why keyboard and mouse doesn’t work on PS4, and created a device to enable these superior input devices. Sony engineers decided – or were told – that the PS4 shouldn’t be able to connect to any old USB device. To that end, they made the console issue challenges to a DualShock controller to make sure the official controller is always connected over Bluetooth. [Frank]’s device solves this problem by taking the USB output from a keyboard and mouse, doing the CRC calculations, and sending them out over Bluetooth. Because the PS4 constantly issues challenges and responses of the authentication procedure, a real DualShock controller needs to be connected to the device at all times. Still, if you want a keyboard and mouse on the PS4, this is the way to do it. All the sources and layouts are up on [Frank]’s github where you’re free to create your own. This isn’t a finished product quite yet; [Frank] still needs to do a redesign of the circuit. Judging from the response of his earlier attempt at keyboards and mice on the PS4, though, this may be a successful product in the works.